Next week, NASA's Messenger spacecraft will become the first probe ever to orbit Mercury. Scientists are hoping the mission will solve a host of mysteries about our neighboring planet. Entering orbit will be "the culmination of the mission, the principle objective," said Messenger principal investigator Sean Solomon, speaking at the annual meeting of the American Association for the Advancement of Science in February. 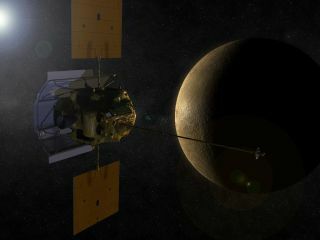 Messenger (MErcury Surface, Space ENvironment, GEochemistry, and Ranging) is slated to conduct a 14-minute engine burn on March 17at 8:45 p.m. EDT to arrive in orbit around Mercury. After a short checkout, the spacecraft will begin high-resolution mapping of the planet's surface by April 4. "We cannot wait for orbital insertion," Solomon told SPACE.com. "The science team is ready to start taking orbital observations, so we are very much looking forward to what all of us hope is a successful orbit insertion into the desired science orbit." The $446 million Messenger probe launched in August 2004. Over the course of three flybys of Mercury, the spacecraft has already furthered scientists' understanding of the closest planet to the sun. Volcanism on Mercury is "aquestion that had been debated for 30 years," Solomon said. NASA's Mariner 10 probe, which flew by the planet in the mid-1970s, imaged some plains on Mercury that suggested they may have been laid down as lava flows, but the images were inconclusive. More recent studies from Messenger imaging provide further evidence for volcanic activity on Mercury in the last 1 million to 2 million years. "We're building up a catalog of probable volcanic centers, many of which seem to have involved explosive volcanism," Solomon said. "That's surprising." Messenger has also revealed features called lobate scarps, where one block of the planet's crust has been thrust over another, in what seems to be the result of a planet-wide contraction. At this point, about 98 percent of Mercury's surface has been imaged. Messenger will make up the rest, and image the surface in greater detail, and under better lighting conditions, than ever before. Overall, the new knowledge gained will help paint a better picture of how Mercury, as well as the solar system as a whole, formed and evolved.